After hours of waiting, killing time in the Walworth County Courthouse while a jury weighed the defendant’s future, both sides received notice—the jury had reached its verdict. Lawyers, family members, victims, the defendant and others filed into the courtroom. Hearts likely were pounding—the forthcoming decision could be the difference between freedom and prison. “For many people, that’s very scary,” she said. 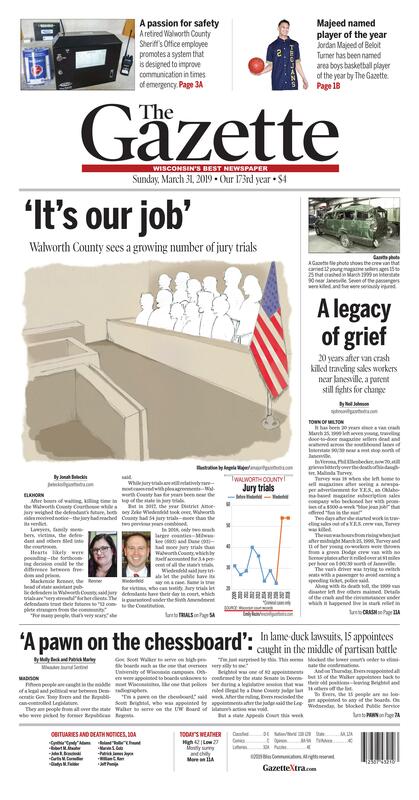 While jury trials are still relatively rare—most cases end with plea agreements—Walworth County has for years been near the top of the state in jury trials. But in 2017, the year District Attorney Zeke Wiedenfeld took over, Walworth County had 54 jury trials—more than the two previous years combined. In 2018, only two much larger counties—Milwaukee (693) and Dane (93)—had more jury trials than Walworth County, which by itself accounted for 3.4 percent of all the state’s trials. Wiedenfeld said jury trials let the public have its say on a case. Same is true for victims, who can testify. Jury trials let defendants have their day in court, which is guaranteed under the Sixth Amendment to the Constitution. Jury trials carry costs, however. Jury trials are time-consuming to lawyers, judges, witnesses, jury members and anyone else involved in the cases, but Wiedenfeld said trials are what his office is paid to do. When prosecutors decide to file charges, they consider if they could prove the case to a jury beyond a reasonable doubt. In 2016, former Walworth County DA Dan Necci left his post. Wiedenfeld officially took over as the county’s top prosecutor in January 2017. That year, Wisconsin saw a 7 percent increase in criminal jury trials—moving from 1,402 to 1,501. Walworth County, meanwhile, saw a 135 percent increase—from 23 to 54—in Wiedenfeld’s first year, according to Wisconsin court data on criminal trials analyzed by The Gazette. These criminal cases include felony, misdemeanor and criminal traffic cases. Both of Wiedenfeld’s first two years saw 54 jury trials. Before Wiedenfeld, the average for Walworth County from 2009 to 2016 was fewer than 30 trials per year. The DA said many factors probably are at play in the jury trial increase. On the practical side, he said, Walworth County had a backlog of cases when he started. Having more cases leads to more trials. Still, Wiedenfeld is charging more cases than his predecessors, even though arrests in the county have been down. Criminal case filings have reached levels higher than they have been in 12 years. But that alone does not explain the higher number of jury trials. Both 2017 and 2018 featured higher percentages—3.1 and 2.7 percent, respectively—of Walworth County cases that went to trial when compared to the total number of cases completed. Both of those percentages are higher than any year in the last 10. Walworth County doesn’t have as many trials as Dane County, whose population is more than five times that of Walworth’s. But Dane’s percentage is at 1.7 percent (Milwaukee County is at 5.4 percent). Wiedenfeld said another factor is how judges in the county decide sentences and what their expectations are for cases. Judges ultimately don’t have to accept plea agreements, so the chance of them rejecting a plea agreement is a factor prosecutors have to consider, he said. Additionally, Wiedenfeld said, he reinstated a policy he learned from former DA Phillip Koss that could cut down on last-minute deals. Assistant district attorneys need his approval to modify a plea-agreement offer if it’s within two weeks of trial. He was an assistant district attorney under Koss when the now-judge was the county’s top prosecutor. A lot of the lawyers who work in the Walworth County courthouse have each other’s cellphone numbers. Renner said it’s because being an assistant public defender or prosecutor is not a 9-to-5 job. Trial preparation takes time. There are police reports to review, videos to watch, witnesses to track down, strategy to plan. But before a case goes to trial, both sides are able to negotiate an offer to end a case without a jury being seated. Cecelia Klingele, an assistant professor at the UW Law School, said an abundance of jury trials could mean plea offers are not being perceived as fair or cases include evidence defendants want to challenge. She said there are other possibilities, too. Renner said she really doesn’t know what the number of jury trials says about plea negotiations in the county. She can just walk her clients through the cost-benefit analysis of each choice. During plea negotiations, Wiedenfeld said, his goal is to do the right thing, which is getting justice for victims and for the public. Trials can give defendants a chance to have their cases put into context. They can tell their sides of the story, Renner said. “And there are cases of actual innocence,” she said. Ultimately, however, she said the decision of whether to go to trial or not isn’t hers to make. “Ultimately, we are doing what our clients are asking of us,” she said. “I’m a pawn on the chessboard,” said Scott Beightol, who was appointed by Walker to serve on the UW Board of Regents. Beightol was one of 82 appointments confirmed by the state Senate in December during a legislative session that was ruled illegal by a Dane County judge last week. After the ruling, Evers rescinded the appointments after the judge said the Legislature’s action was void. But a state Appeals Court this week blocked the lower court’s order to eliminate the confirmations. And on Thursday, Evers reappointed all but 15 of the Walker appointees back to their old positions—leaving Beightol and 14 others off the list. But it’s unclear if his seat will be waiting for him. UW System officials and Board President John Behling did not respond to whether they consider Beightol a regent or not. “It has made just the basic functioning of state government much more complicated and has introduced uncertainty that just shouldn’t be there in our process normally,” he said in an interview. The December confirmation vote by the state Senate did not put the appointees in the jobs for the first time—the appointees had already been serving in their roles before then. Republicans passed the lame-duck laws after Evers and Kaul won their elections but before they were sworn in. The laws barred Kaul from settling lawsuits without the approval of lawmakers, limited Evers’ control of the state’s economic development agency and prevented Evers from making changes to public benefits programs without their approval. Many of the appointees—both those who were reappointed and those who were not—are longtime donors to Walker and Republicans. Walker’s most important appointments were left vacant by Evers. On Friday, Fitzgerald sent a letter to Evers saying he considered Evers’ re-appointments of the 67 people invalid because he believes they continue to hold their positions from when Walker appointed them. “Any attempt to change these appointments would violate the court order and I will not participate in any such action,” Fitzgerald wrote. In a second case, Dane County Circuit Judge Frank Remington on Tuesday halted some provisions of the lame-duck laws, but his ruling was not as extensive as Niess’ order. Remington’s decision remains in effect, but lawmakers are appealing it. Gorsuch said he wanted to serve the state but will ultimately go along with whatever he’s told to do. “I don’t think that that suit was in the interest of Wisconsinites and so by withdrawing from that (appeal) we’re no longer in litigation in that case against protections for transgender people under the Affordable Care Act,” Kaul said. Courts have yet to rule on other cases Kaul is trying to drop—one challenging the entirety of the Affordable Care Act and one challenging federal rules on mercury emissions. While Niess’ decision was blocked by the state Appeals Court, Kaul said the ruling by Remington allows him to continue to try to pull the state from lawsuits he does not believe are in its interest. The WAVE system is designed to help keep people safe in schools, hospitals and other buildings by improving communications at the start of an emergency situation. Jordan Majeed has been named The Gazette’s 2018-19 area boys basketball player of the year. A 1999 Gazette file photo shows tire tracks in the grass alongside I-90/39 north of Janesville. It’s the scene where a crew van carrying 14 young magazine sellers crashed March 25, 1999. Seven of the passengers were killed, and five were maimed. Last week was the 20-year anniversary of the crash and the 10th anniversary of a state law change that more strictly regulates traveling door-to-door sales. A sign at the rest stop north of Janesville lists the names of seven traveling door-to-door magazine subscription sellers killed in a March 1999 van crash on Interstate 90/39. A cherub sits in a tree where a broken sign lists the names of those killed in a March 1999 van crash on Interstate 90 near Janesville. Seven young people were killed and five were seriously injured. A Gazette file photo shows the crew van that carried 12 young magazine sellers ages 15 to 25 that crashed in March 1999 on Interstate 90 near Janesville. Seven of the passengers were killed, and five were seriously injured. Investigation of the van that carried 14 young magazine sellers ages 15 to 25 and crashed in March 1999 on Interstate 90 near Janesville. Seven of the young people were killed, and five were seriously injured. A Wisconsin State Patrol officer stands along Interstate 90/39, near the site of where a van crashed March 25, 1999 near Janesville in a Gazette photo. Seven of the passengers, all young door-to-door magazine subscription sellers, were killed and five were seriously injured. It has been 20 years since a van crash March 25, 1999 left seven young, traveling door-to-door magazine sellers dead and scattered across the southbound lanes of Interstate 90/39 near a rest stop north of Janesville. Along with its death toll, the 1999 van disaster left five others maimed. Details of the crash and the circumstances under which it happened live in stark relief in volumes of police, state and federal labor commission and department of justice reports, and criminal court documents—a tome that details illegal and abusive labor practices by magazine-subscription-seller Y.E.S. that put young people—some of them minors—in jeopardy. The most recent deaths, Ellenbecker said, came Feb. 16 in a two-car crash in Montgomery County, Indiana, that happened after a vehicle occupied by three traveling door-to-door sales crew lost control on a freeway overpass. “Those kids were just thrown. Their bodies hit the highway at 81 miles per hour,” Ellenbecker told The Gazette in a phone interview late last week. Conger, the town of Milton cop who witnessed the van crash, worked with Ellenbecker to press for the law changes. In some other states, traveling door-to-door selling continues to operate with little regulation. An Alabama company that Ellenbecker said had two traveling salespeople killed Feb. 16 in Indiana has had 52 complaints registered through the Better Business Bureau in the last three years and has a “F” rating by the trade advocacy group. Late last week, the site was decorated with stuffed dolls and figurines. One stuffed doll, a toy monkey, was clad in a small t-shirt that read “Explore.” The doll’s fur and plastic eyes were desiccated and faded by the elements. Turvey would been 38 years old now. But for Ellenbecker, she’ll always be an 18-year-old who lives only in photographs.